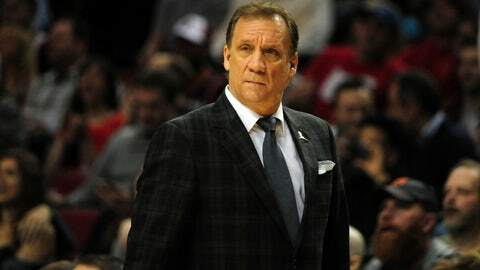 Flip Saunders went 654-592 in 17 NBA seasons with the Timberwolves, Detroit Pistons and Washington Wizards. MINNEAPOLIS (AP) — Flip Saunders, who rose from the backwaters of basketball’s minor leagues to become one of the most powerful men in the NBA as coach, team president and part owner of the Minnesota Timberwolves, died Sunday, the team said. He was 60. Saunders was diagnosed with Hodgkin lymphoma in June and doctors called it "treatable and curable." But he took a leave of absence from the team in September after complications arose during his treatment, which included chemotherapy. He had been hospitalized for more than a month. "Flip was a symbol of strength, compassion, and dignity for our organization," owner Glen Taylor said in a statement. "He was a shining example of what a true leader should be, defined by his integrity and kindness to all he encountered. Sam Mitchell has been named interim head coach and GM Milt Newton is heading the team’s personnel department. The Timberwolves had started to practice on Sunday when Newton got word from Taylor of Saunders’ death. Practice was halted and a devastated Garnett left the floor, walked to the parking garage at the practice facility and sat down in the spot marked for Saunders. He posted a picture of the moment on his Facebook page with the message "Forever in my heart …"
"He was a great human being and one of the best offensive minds in basketball," Michigan State coach Tom Izzo, a friend of Saunders for three-plus decades, told The Associated Press. "I could talk basketball with him all day and night." Not long after graduating, Saunders got into coaching to begin a long and winding path to the NBA. He started at Golden Valley Lutheran College just outside of Minneapolis and was as an assistant at Minnesota and Tulsa before seven seasons in the Continental Basketball Association. Saunders often credited his stint in the CBA with instilling in him the work ethic and breadth of organizational knowledge he needed in the NBA. He made stops in Rapid City, South Dakota; La Crosse, Wisconsin; and Sioux Falls, South Dakota, and often retold stories of his adventures in the minor league while expressing affinity for the NBA coaches who followed similar paths. He landed in the NBA in 1995, when he wrote a letter to new owner Taylor asking for a job. His college buddy, McHale, took over the basketball operations with the Timberwolves and Saunders became the general manager. When Bill Blair was fired 20 games into the season, Saunders was suddenly the head coach of a struggling franchise that had never made the playoffs. Saunders and Garnett led the Wolves to eight straight playoff appearances, the last a trip to the Western Conference finals in 2004. He was fired the next season when the team disintegrated thanks in large part to contractual battles with Latrell Sprewell and Sam Cassell. The Wolves have not made the playoffs since. Saunders won 64 games in his first season in Detroit in 2005-06 and 176 in his three seasons coaching the Pistons. But he couldn’t quite get a veteran-laden team over the hump and into the NBA Finals, so he was dismissed in 2008. He coached three more years in Washington before returning to Minnesota as president of basketball operations in 2013. Again, he took over a franchise in turmoil and was bringing the Timberwolves back to relevance before he fell ill.
Saunders deftly handled the exit of disgruntled forward Kevin Love, trading him to Cleveland for a package including budding young star Andrew Wiggins and Thaddeus Young, who was flipped to Brooklyn in February to secure Garnett’s return. "Flip you were one of a kind. Great basketball mind and even better human being," Love said on Instagram. "You had a great impact on my life personally and professionally. RIP my friend. Prayers are with the Saunders family during this time." Saunders also signed Ricky Rubio to a four-year contract extension, drafted Zach LaVine, Shabazz Muhammad and Karl-Anthony Towns, brought in veterans Andre Miller and Tayshaun Prince and helped design a new $25 million practice facility across the street from Target Center. "Today is not a day to reflect on Flip’s accomplishments in basketball or what he brought to us as an organization on the court, but rather to indicate what he meant to us as a co-worker, friend, member of the community and the basketball world at large," Taylor said. "We as an organization are devastated by his passing, and our hearts and prayers go out to (his wife) Debbie and the entire Saunders family as they endure this extraordinary loss." Saunders is survived by his wife, Debbie, son Ryan and daughters Mindy, Rachel and Kimberly. "The Timberwolves have lost a brilliant leader, and Minnesota has lost an outstanding citizen," Minnesota Gov. Mark Dayton said. "We have all been blessed by your wonderful life, Coach Flip," Muhammad tweeted. "You will be deeply missed. Rest in peace." "And I’d say `Well, you don’t really understand unless you’re from Minnesota. You really don’t get it. Even when it snows on May 3rd you really don’t get it,’" Saunders said. "And the loyalty and the passion that the people have here is what always drives me back."